Cabinets have more options than ever. Make a well thought out plan for your storage needs and how you like to cook. All of these features are not available in all cabinet lines. 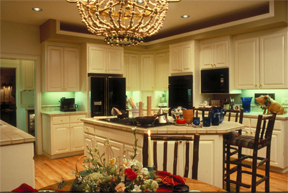 Check with your cabinet manufacturer to see what items they offer. Lazy Susan’s with turntable shelves make the most out of storage for corner cabinets. Pull out shelves make it easier to reach hard to reach items at the back of a deep cabinet. Pull out drawers with a taller front or lip are also available. 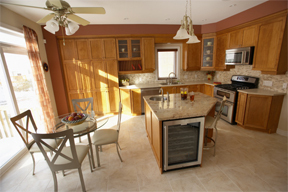 Appliance garages are designed to hide small appliances and keep the counter looking free of clutter. Full extension drawer slides allow the back of the drawer to pull out past the face of the cabinet allowing large pots to be lifted out vertically instead of having to tilt them at an angle to remove them. Spice racks can be found in drawers, inside of doors or in a small pull out cabinet designed into the base cabinets. Keep in mind that spices need to be near the stove, but not too close because heat will quickly weaken the strength of the spices. Special inserts can be purchased for heavy items like mixers so that they can rise to countertop height without having to be lifted from a base cabinet. Custom panels can be created for some appliances so that the face of the appliances looks like the cabinet rather than disrupting the flow of the cabinet finish. Pull out tables are available in higher end cabinet lines that serve as another workstation, but can be retracted much like a pocket door when not in use. Wicker baskets can be inserted into areas with no doors for optimal storage and a unique look. Open shelving is a good option for displaying decorative items or cookbooks. Built in trash cans and recycle stations can be included inside a cabinet. Some cabinet lines offer double stacking waste baskets in the same cabinet. Built in laundry hampers are available for the bathroom. Pull out towel racks are available mounted in the doors of some cabinet lines. These are helpful in the bath as well as the kitchen. Roll out serving carts that look like a cabinet door when retracted are great time savers and space savers. Tilt out bins with wood or glass fronts make reaching for vegetables or other items a cinch! Decorative plate racks installed in the upper cabinets make reaching for dinner plates very convenient. Small apothecary drawers are perfect for small items that typically get lost in standard size drawers. File inserts can be added for kitchens with separate work stations. Knife blocks with separate slots for each knife keep knives in a safe organized place that keeps the counter clean and the knives from getting damaged by being in the same drawer together. Cutlery dividers that are made to the exact specifications of your drawers keep your utensils neat and organized. Again, to keep the countertop less cluttered, pull out cutlery boards are a nice option to be able to store after being used rather than seen on the countertop. Tilt down sink front drawers are a perfect place to keep sponges and small dish cleaning items. To keep bread fresh and in a consistent spot, stainless bread boxes are available as drawer inserts. Media drawers that specifically fit CD’s and DVD’s can be incorporated into kitchen work stations. Pantries have a variety of different configuration options from wood versus metal rack interiors, pull out and stationary shelving, pull out spice racks, sliding trays and drawers and other special storage options.